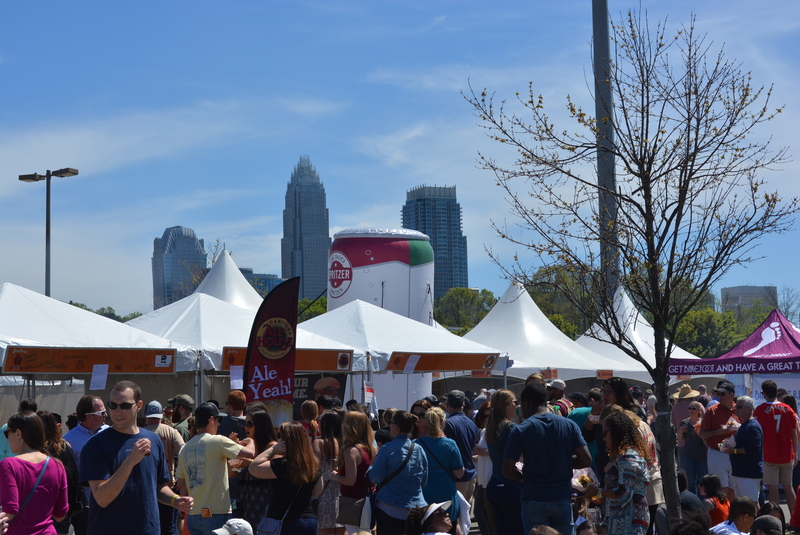 The Moo & Brew Fest, which debuted in 2015, is a new annual festival and competition celebrating two things near and dear to our hearts here at the Charlotte Burger Blog—burgers and beer. 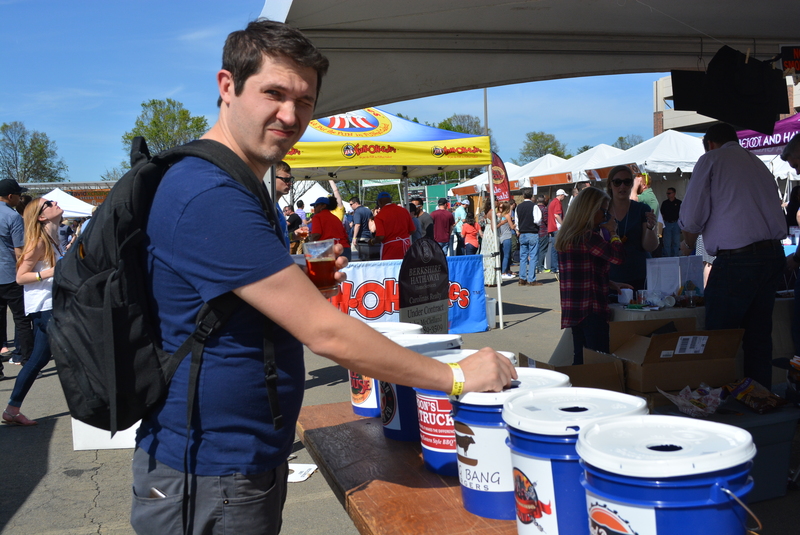 Held at the NC Music Factory, it’s mostly a beer festival where you can sample a ton of regional breweries. 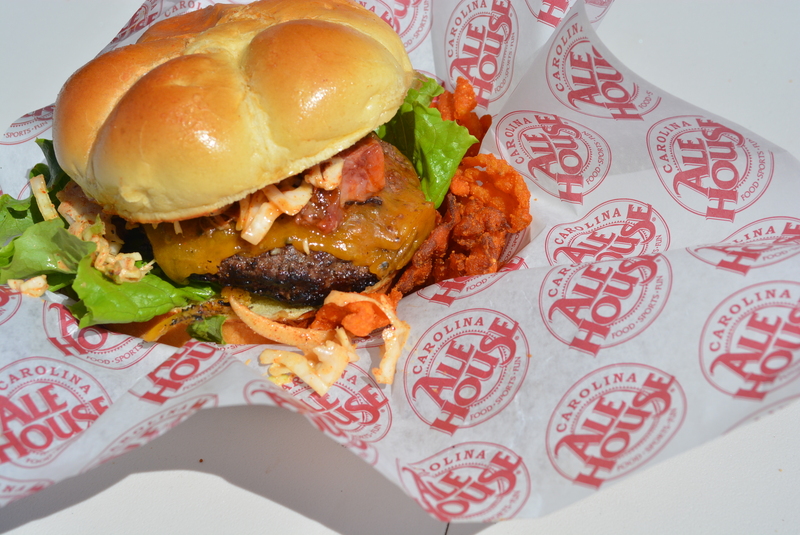 It also pits several a few Charlotte burger joints here in town against each other vying for the title of Creative Loafing’s Best Burger in Charlotte. 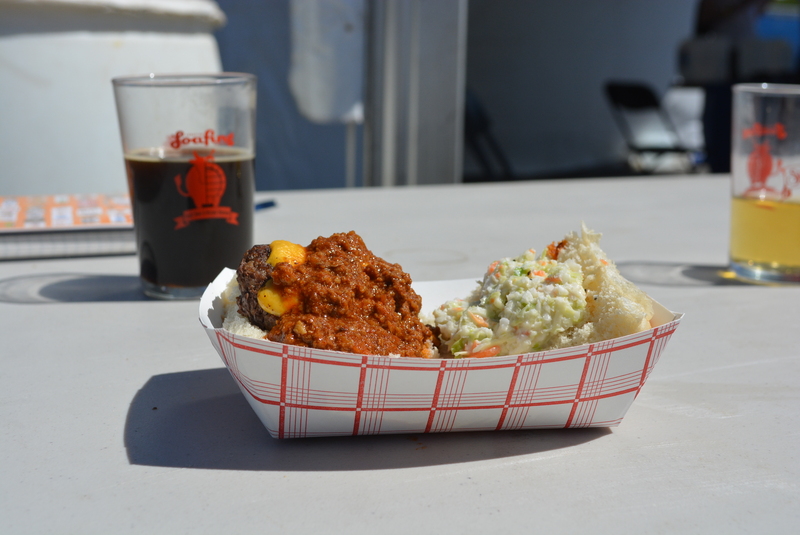 We were on a hiatus here at the Charlotte Burger Blog last year at this time, and thus we missed the first annual Moo & Brew Fest. 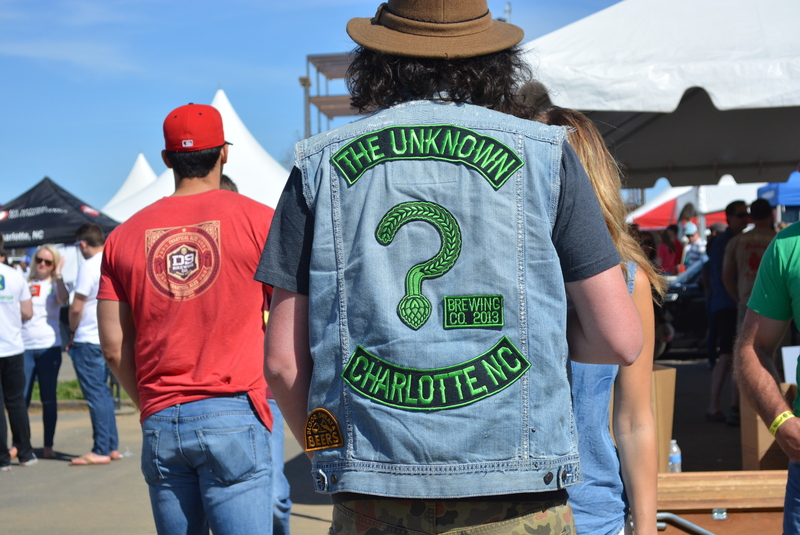 I think it’s time we admitted that we let the entire city of Charlotte down by our lack of participation. That wasn’t going to happen this year. 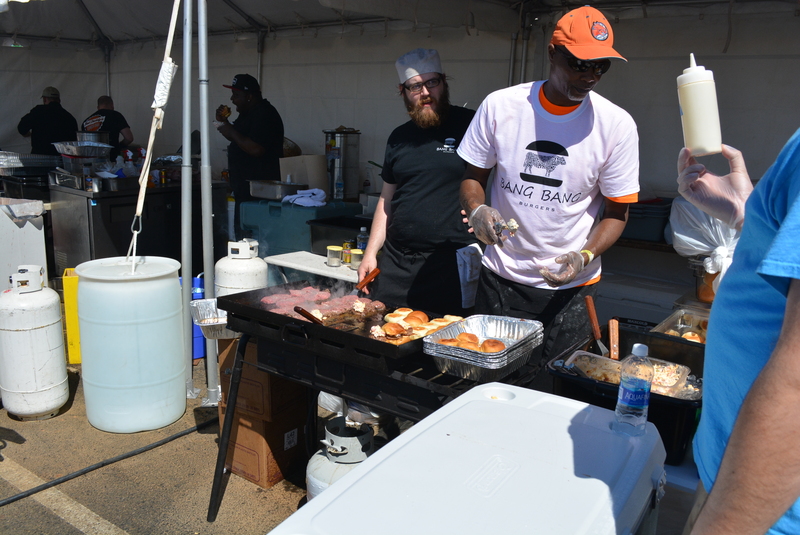 I, along with my editor here at the Charlotte Burger Blog, Pepper, spent some time there on Saturday trying as many burgers and beer that we could handle. 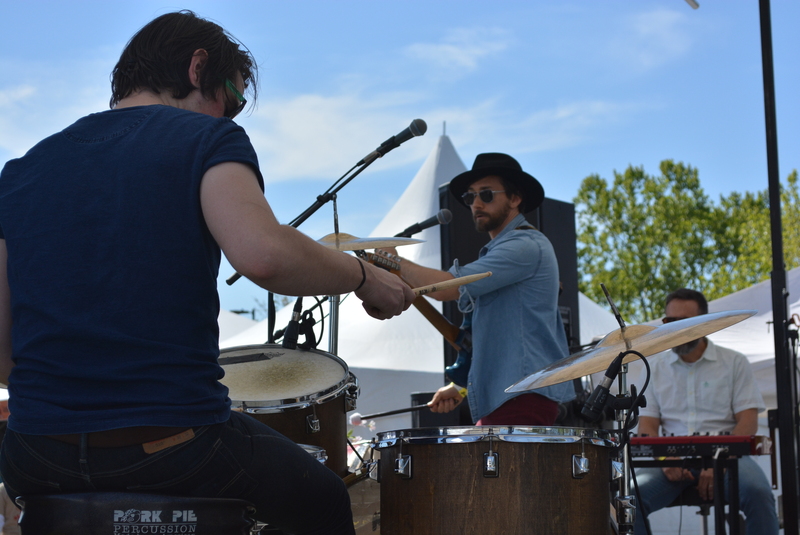 Here is a photo diary of our experiences. 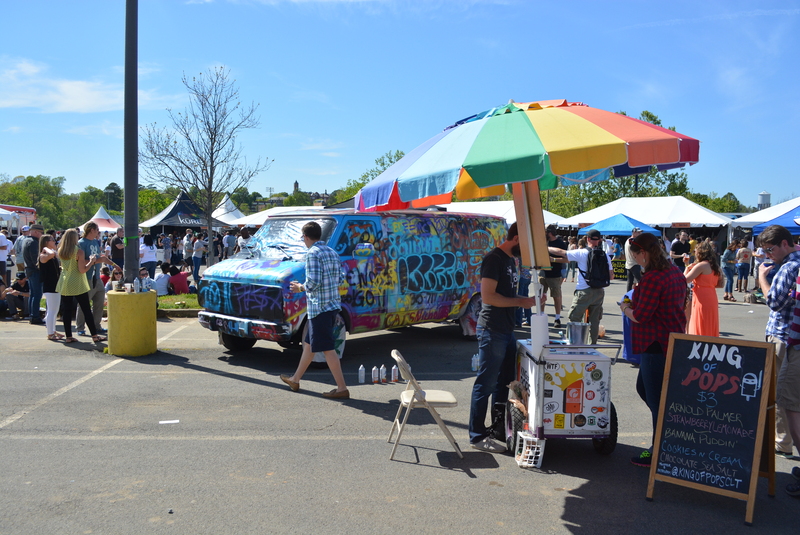 Hereford: The Moo & Brew Fest was held in the shadow of Charlotte’s skyline in the parking lot of the AvidXchange Music Factory. 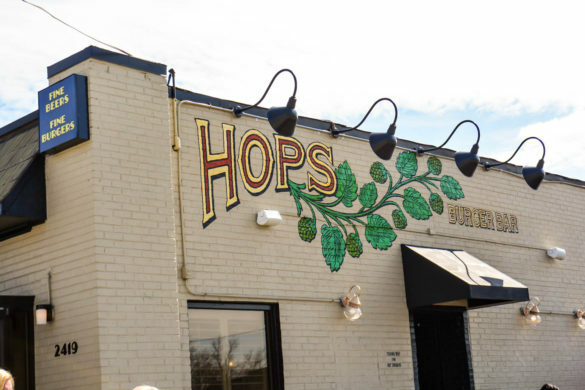 Pepper: The Moo & Brew Festival has been in Charlotte for a couple years now, but what you may not know is that in a few short weeks, Moo & Brew will be opening as a new restaurant in the Plaza Midwood area. 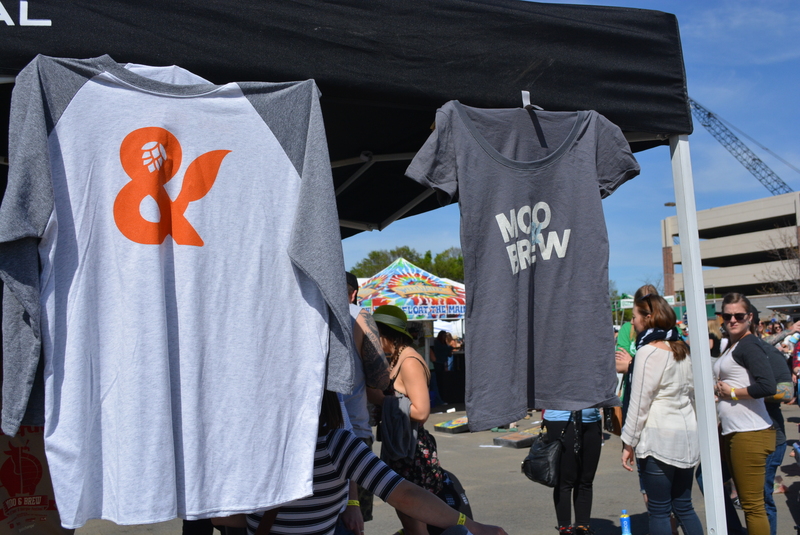 (They’re the ones with the big sign on the front that says “notacondo.com.”) The t-shirts you see above are part of the restaurant’s new logo, though it’s also a logo for the festival. 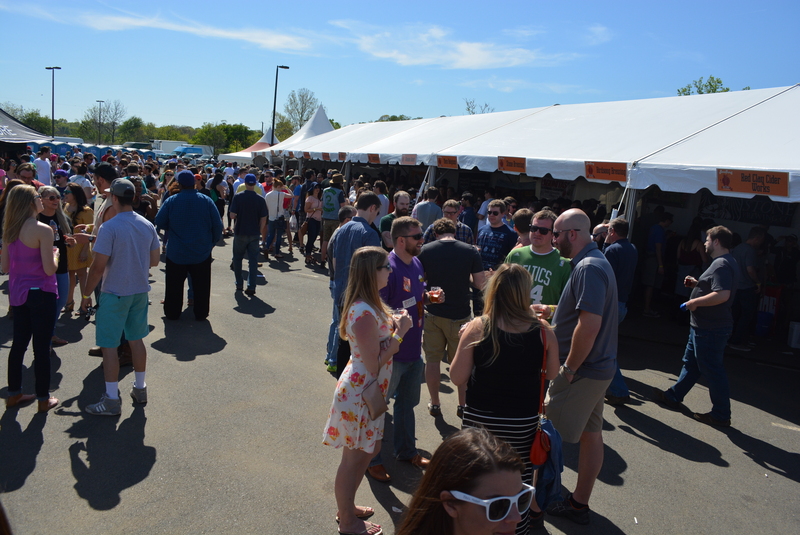 So, to recap, there is the annual Moo & Brew Festival, which has now spun off into a restaurant with the same name. 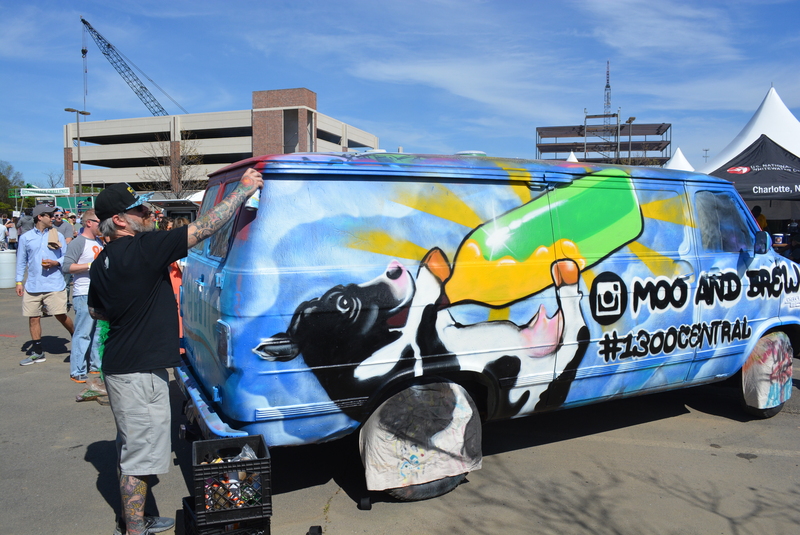 Expect a lot of moo and a lot of brew. Hereford: I’m sure that won’t get confusing. 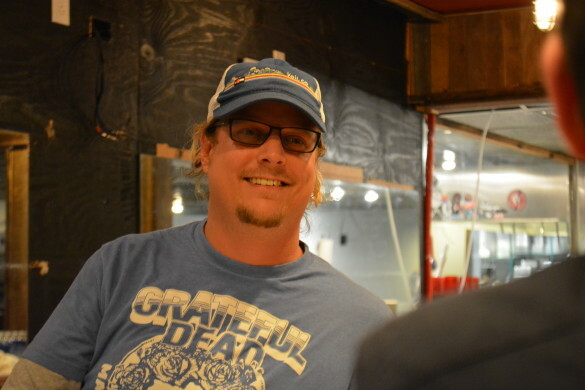 No word yet on if the new restaurant will be a festival competitor. 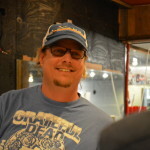 Incidentally, recently we sat down with Zach Current, one of the guys opening Moo & Brew (the restaurant) in Plaza Midwood. We’ll be running it relatively soon when they get closer to opening. Hereford: Here is where the votes were tallied. When you came in you got one square token to place in the buckets after you’ve tried the burgers. 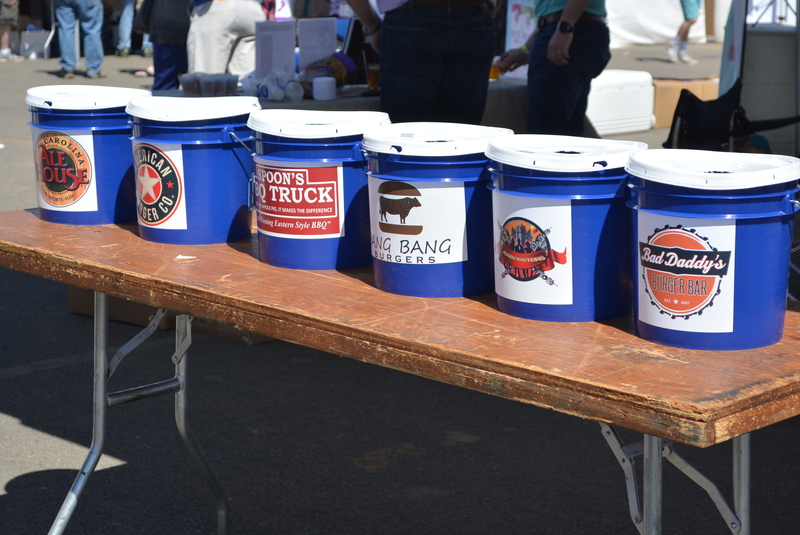 The bucket with the most tokens wins. No poll workers were there checking IDs, so vote-rigging was likely rampant. 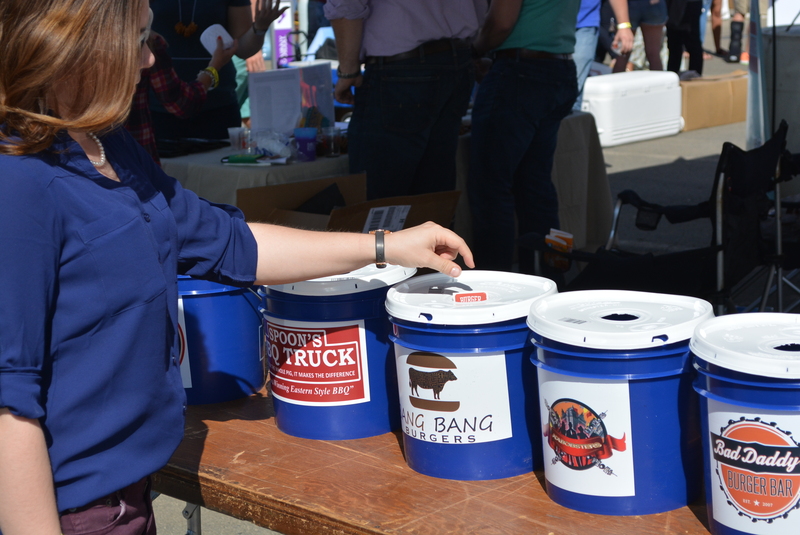 Pepper: I have a great bucket, okay? People say it’s the best bucket, no one else has a bucket like I do. If I had gotten the buckets–because I’m very rich, you know, I have a lot of money—they would’ve been huge, believe me. Biggest buckets you’ve ever seen. That’s what people don’t understand, they say “what’s wrong with shoeboxes,” but it just doesn’t make any sense, okay, it just doesn’t work for everyone, and other people say, you know, “why didn’t someone just buy buckets,” and that’s a problem, okay, because it’s a very silly move, it’s not a winning strategy, and I think that’s why I should’ve, you know, been in charge of these things. Hereford: I started to do a Bernie version of that, but it’ll never be as good as what you wrote. Hereford: I have no idea what was going on in this tent, but I’m pretty sure it didn’t actually have anything to do with medicine. Pepper: I saw a fake spine. It was creepy. Hereford: I won’t comment on all the beer I had at Moo & Brew, mostly because I had a lot of beer (I had $45 in value to drink my way through! 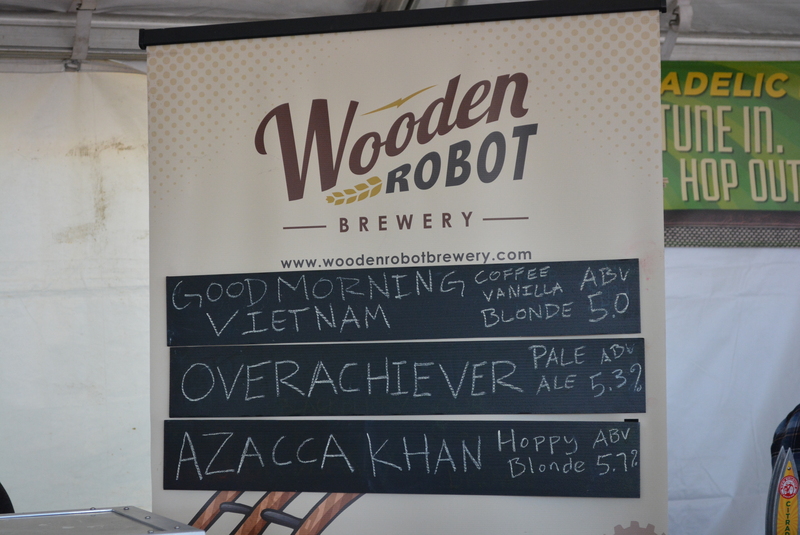 ), but I started at Charlotte’s own Wooden Robot brewery. Pepper: And there wasn’t just beer! There were so many ciders! 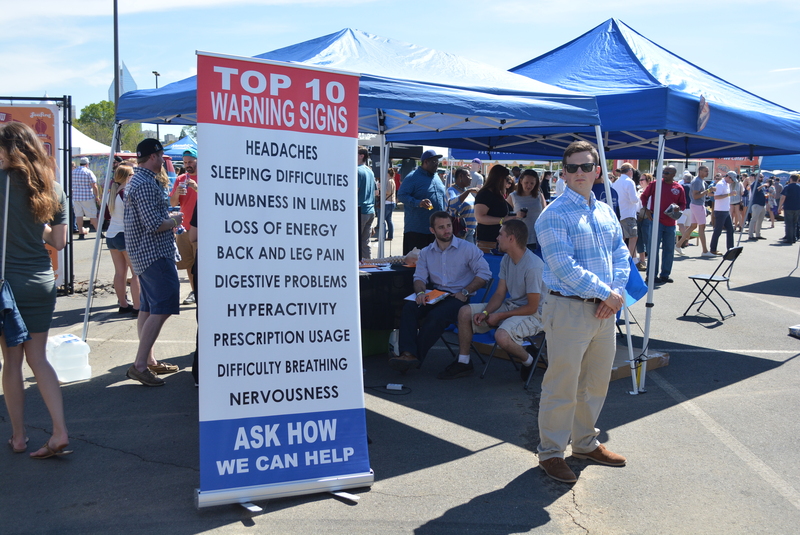 It was great; I was only expecting maybe one single drink, but there were at least two whole tents dedicated to them, and they each had several options. 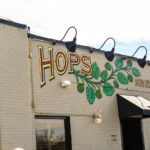 My favorite was the Hoppin Good Thyme, made with hops, lavender, and thyme, at Red Clay Cider Works. It was refreshing and unlike any cider I’ve tried before. Hereford: Unlike the beer, the cost of admission did not include your burgers. You had to pay for them separately, but they were mostly reasonably priced. 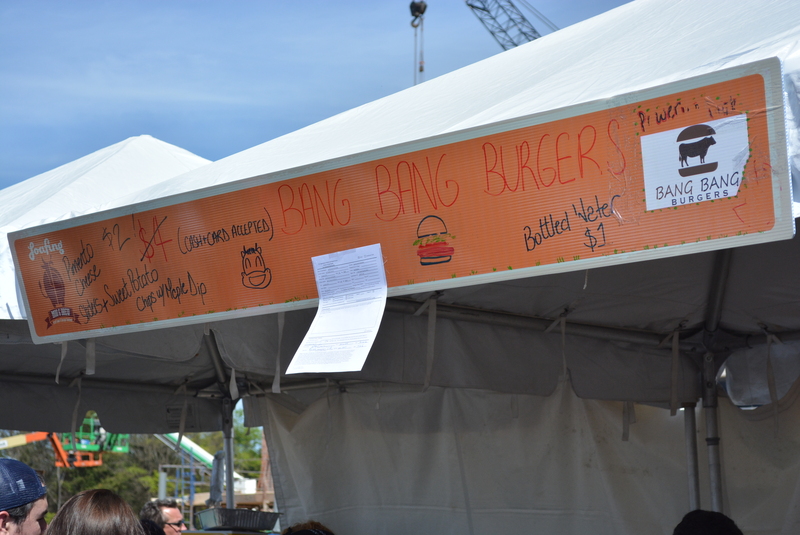 Pictured here is Bang Bang’s tent, offering their mini burger for $4 $2. 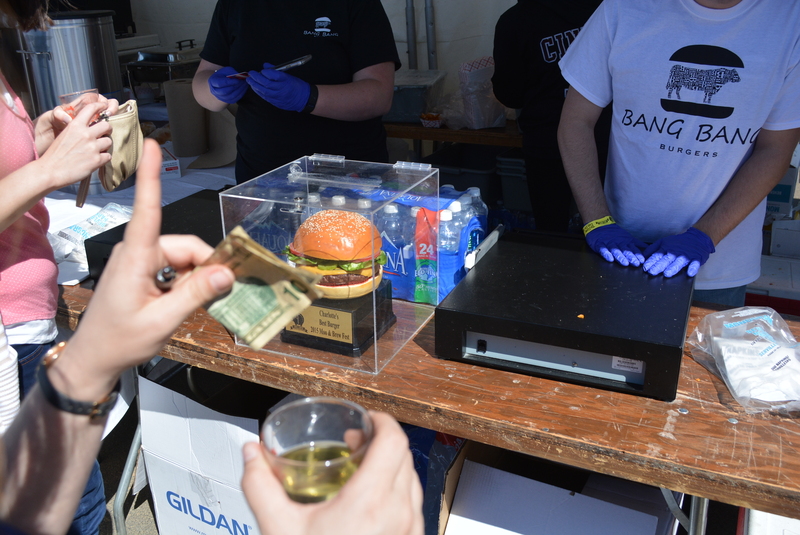 Pepper: Since Bang Bang Burgers won the title last year, we were really excited about trying their burger, so we made an executive decision to hit theirs last. The first place we hit up was Bad Daddy’s Burger Bar. Pepper: It can be really tricky to cook sliders (and that’s basically what this tasting sample was) without over-cooking them. I’m not sure where the steroids part came in, either. It seemed like a normal bacon cheeseburger with lettuce, onions, and a pickle. Maybe because the cheese was spicy? Hereford: I suppose they could have meant literal steroids—this cow has been treated with some growth hormone or something. It’s time for the counter-revolution: genetically modified foods fans unite! Pepper: Growth hormones don’t genetically alter food. I’m shutting down your counter-revolution before it begins. 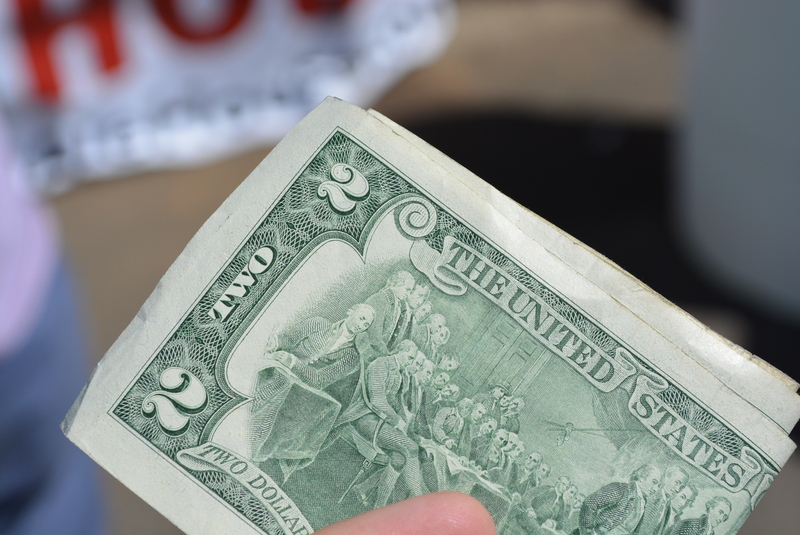 Hereford: They nearly ran out of change at the Bad Daddy’s tent, so they had to give me a $2 bill. I’m not saying that the person who gave them a Deuce note was a stripper, but I am saying that I can’t think of any other explanation. Pepper: An old man on a plane once gave me a couple $2 bills. Maybe it’s the same guy, and he just goes around to random places showering people with outdated currency. Maybe he’s the sole reason we still have them. I feel like I should also add that I am not a stripper. 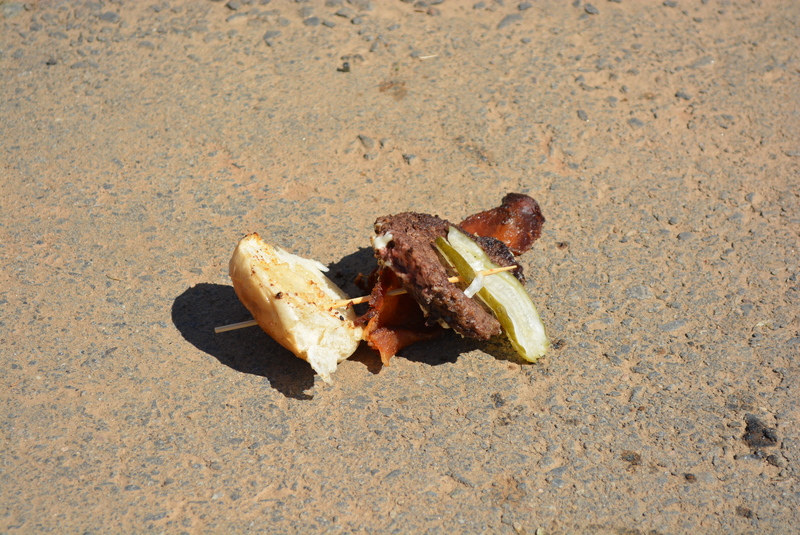 Hereford: We found one sad Bad Daddy’s burger on the ground, nearly uneaten. Pepper: I like to think the person who ate this immediately went into a ‘roid-rage and threw it on the ground. 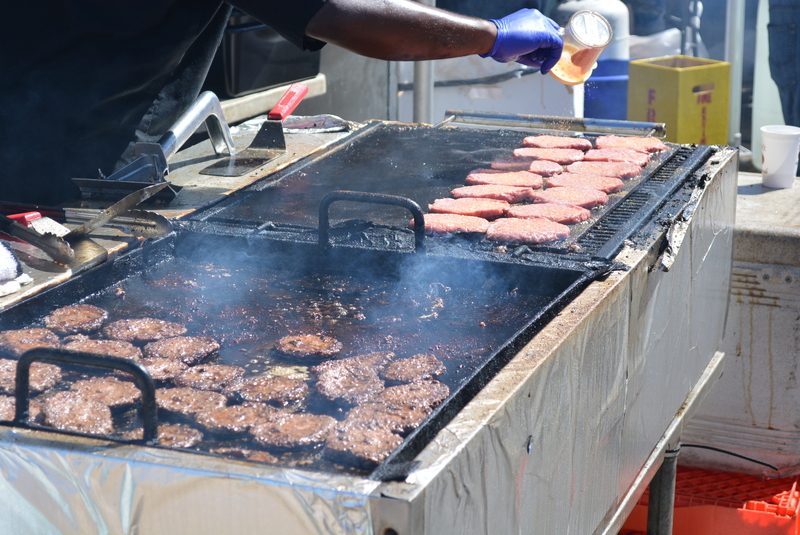 Hereford: Behind the food tents were the grills, where the hamburgers were being prepared. The grills gave the festival air a nice odeur de boeuf. Pepper: Beef smell. You’re looking for beef smell. 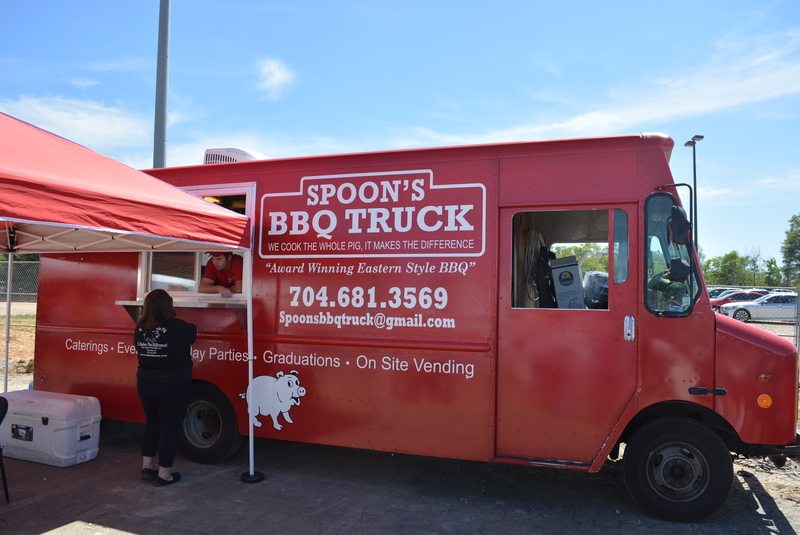 Hereford: Maybe for a pleb like you…..
EXHIBIT B: SPOONS BBQ TRUCK Actually, we didn’t try them…. 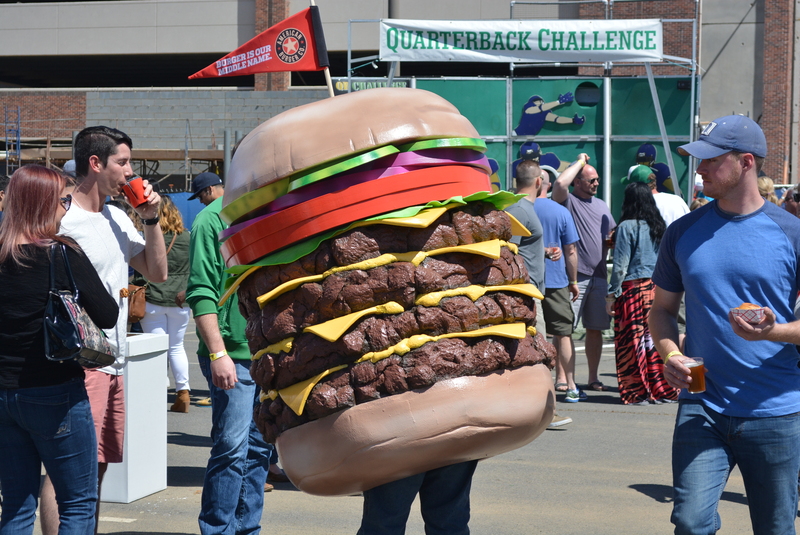 Hereford: My goal was to try each burger entered in this competition. I’m on a relentless quest, after all. 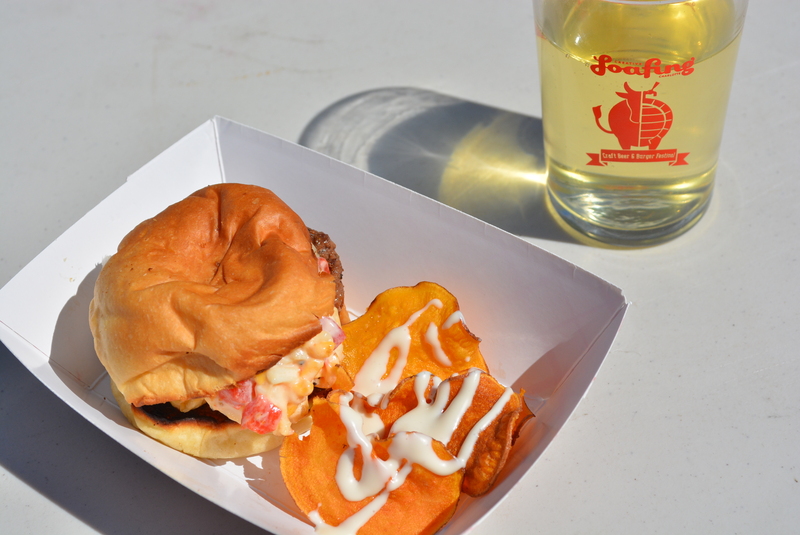 But I didn’t get to try BBQ truck’s sliders. Why? Because I was told that to have their burger, you had to have a ticket. “How do you get a ticket?” I asked. “I think you have to have a VIP pass,” the nice people at Spoon’s said. I’ll say it—that’s straight up dumb. 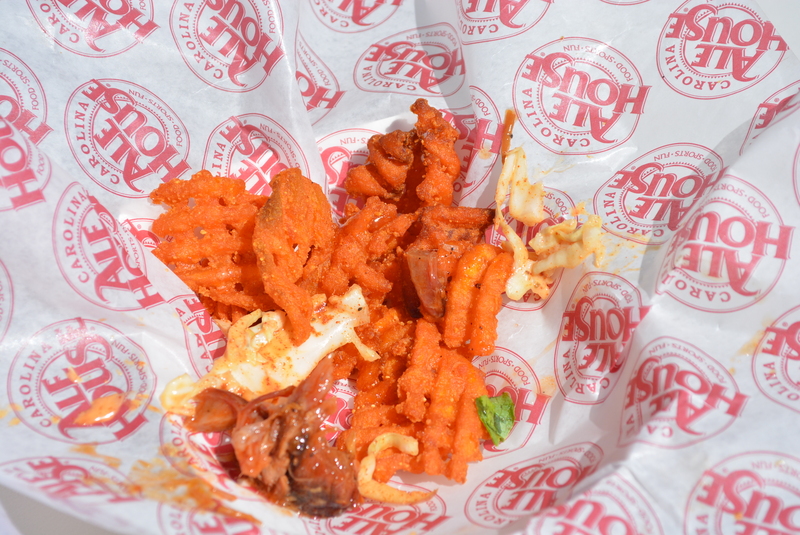 EXHIBIT B: KABOBSTERS ….Actually, we didn’t try them either. Hereford: Another food truck, Kabobsters, was there as well. Unlike Spoon’s, I could have bought their burger. But it was full price, and was presumably a full size burger. That didn’t make any sense. If I’m going to be trying a ton of burgers, I think they should all be sample size. Pepper: And they looked so good! They had two different turkey burgers! Two! 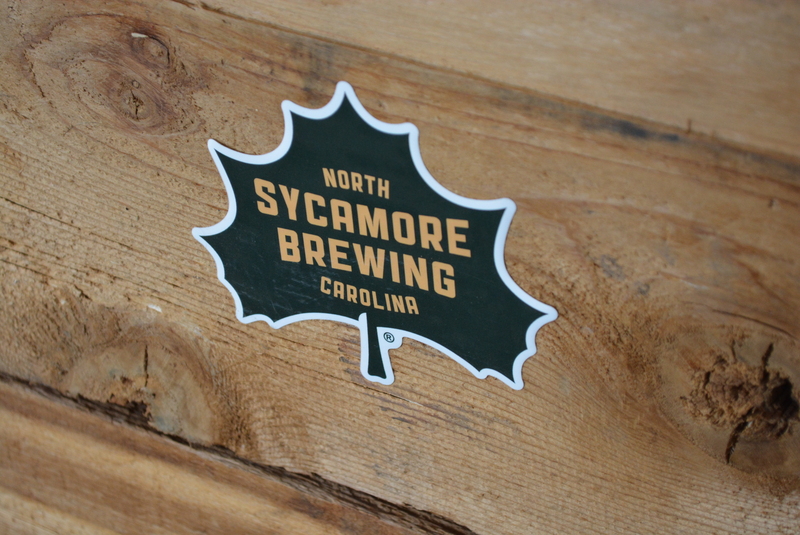 Hereford: To console myself from a lack of food truck burgers, I got beer from North Sycamore Brewing Carolina, Sycamore Brewing North Carolina, North Carolina Sycamore Brewing. Pepper: You’re uh, really trying to push those strikethrough jokes through, aren’t you? Pepper: I tried to convince Hereford to take a picture with Burger Man™™, but he kept mumbling excuses and disappearing. Hereford: I have a very rational fear of mascots. They’re not natural and should be destroyed. 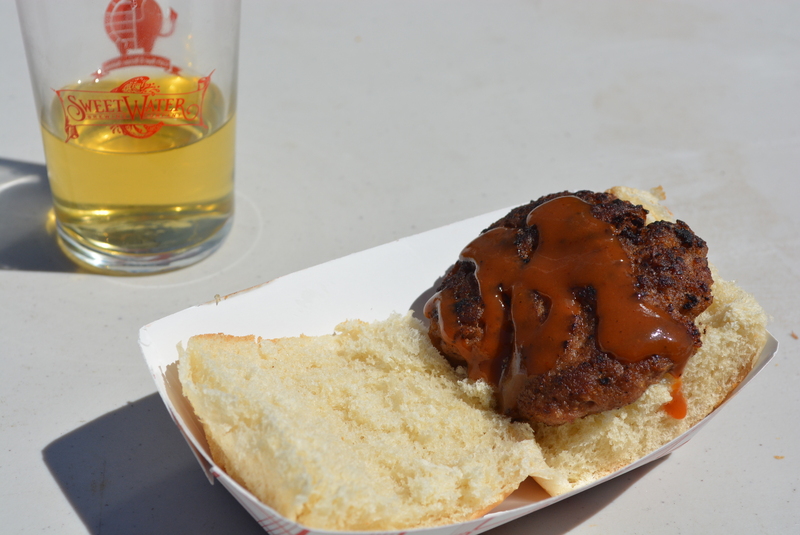 Hereford: This was easily the smallest burger I tried at the festival. It was about the size of a baby’s fist. I thought it was good. Again, this was straightforward and safe. Pepper: I got excited when I saw they had a turkey burger. 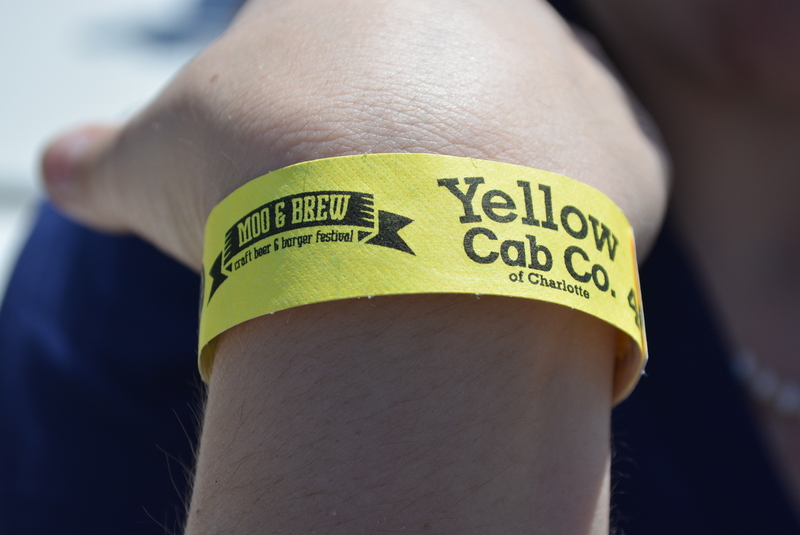 I had just assumed since it was the “Moo and Brew Festival” that there would only be, you know, moo. But then there was turkey! They asked me if I wanted cheese on it, and I said no thanks, because, hey, I was curious to see the other toppings. That above is what I got. Actually, I added the sauce, which seemed like a barbecue sauce. I literally just got meat and a bun. Dry meat and a regular white bun. It looked sad. I was sad. 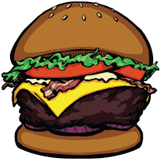 Hereford: By the way, in two weeks here at the Charlotte Burger Blog we’re going to be debuting a new feature called “Beyond the Beef,” where Pepper reviews all the non-cow burger options I won’t. Hereford: To keep the day moving along Moo & Brew had a succession of pretty decent bands playing. My favorite was Ancient Cities, pictured above. Hereford: Before I went for my third burger, I had to get another beer. 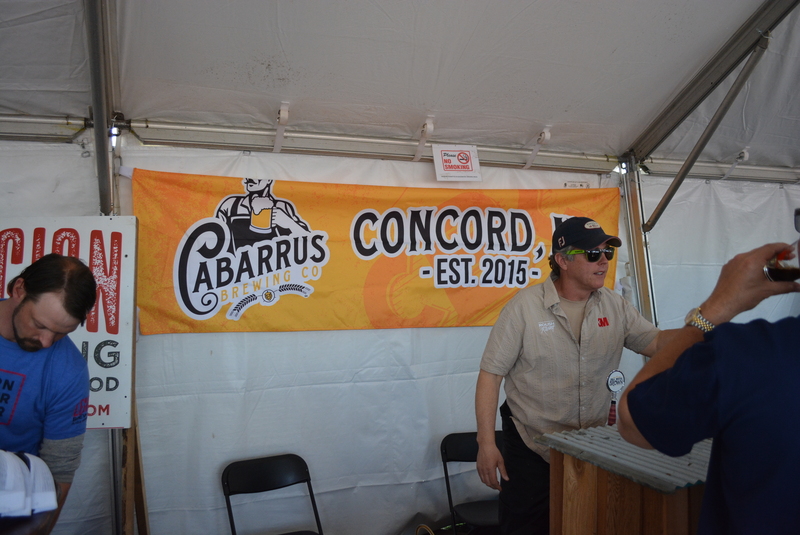 This time I stopped at one of the newest breweries in the region: Cabarrus Brewing Company. Pepper: I’m not a huge sweet potato fan, so I was happy to let Hereford have my share. 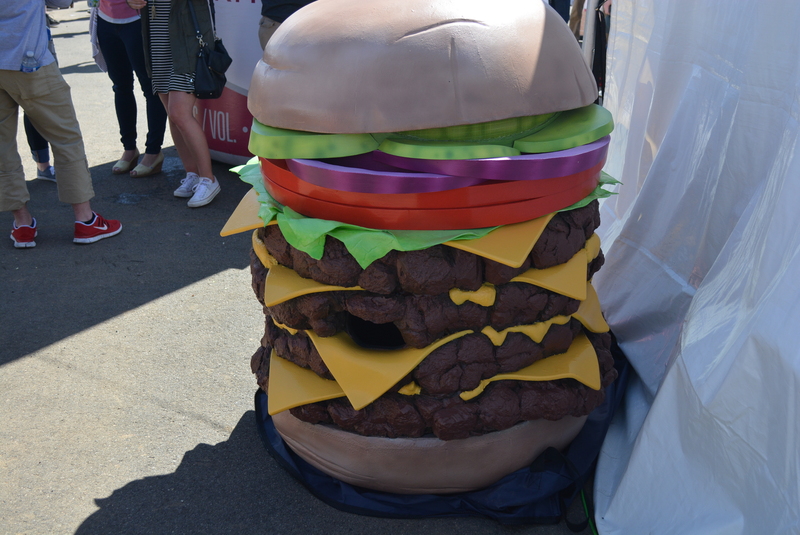 By the time we were at the third burger, I was feeling pretty full, so I could only stand a couple bites of it. I really wish it had been smaller! It felt like a waste for a tasting competition. Hereford: Honestly, I didn’t think it was very good. The beef was burnt and bitter, though the barbecue was pretty good. If it was just a barbecue sandwich I wouldn’t have complained. Much. Pepper: At this point, I was wondering if there would be any burgers that weren’t overcooked and dry. Hereford: They really should standardize the sizing of these burgers and the price if we’re going to be judging them. Hereford: We’re finally experiencing some warm weather here in Charlotte. Since it’s been cold recently, I’m sure a lot of people weren’t prepared for the heat and the sun. That’s okay, because NoDa’s got your back! Hereford: So, this is a thing. 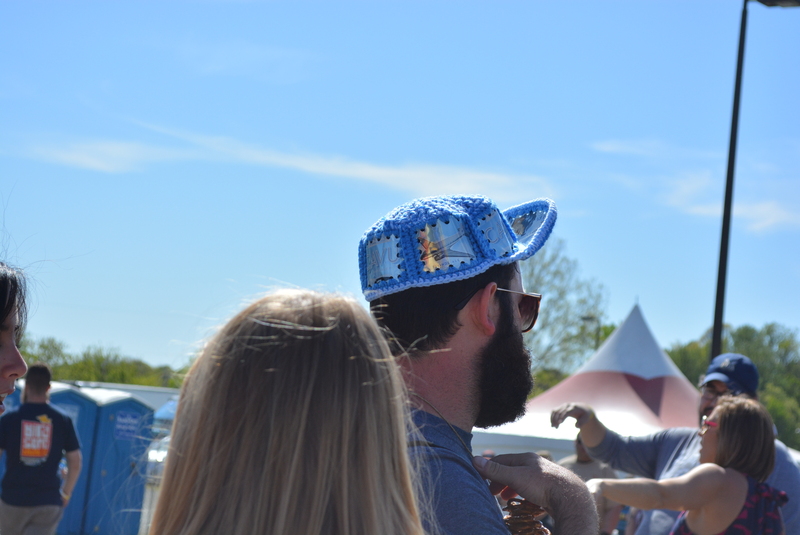 The panels on this knit cap come from NoDa brewing cans. 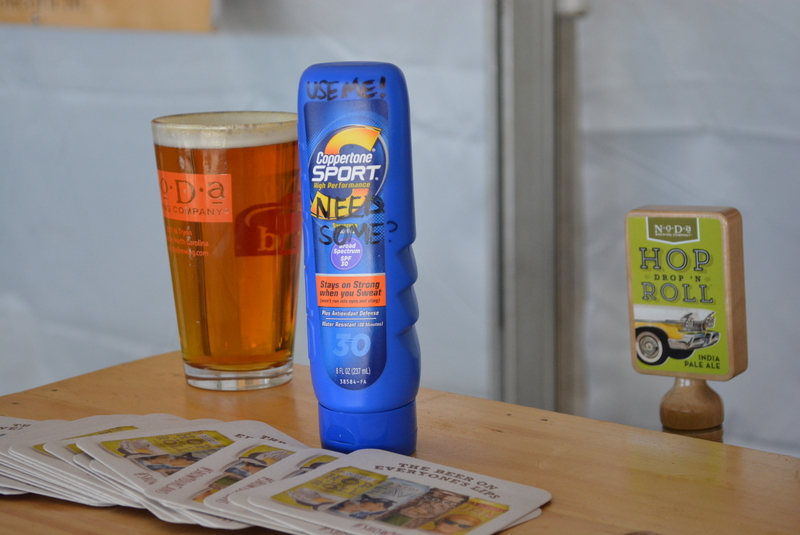 It was the second best random beer accessory I saw at Moo & Brew this year. Pepper: The folks over at NoDa said the owner’s mom knits them! Aww. Hereford: The cap was the second best, and this one was the best. Pepper: I was really hoping for double-denim, but you can’t have everything. Pepper: Holy crap I wanted King of Pops so bad. I’ve been wasting away this winter without them. Unfortunately, I was too incredibly full to even think about them by the end of the tasting. Looks like I’m going to have to stalk them online this week to make up for it. Hereford: I really wanted to jump in and start on my Charlotte Burger Blog themed section, but Pepper wouldn’t let me. Pepper: We both know if I had let you do that we would’ve been stuck there for the next 6 hours. The layers of paint from you starting over multiple times would have been thicker than a Kardashian’s makeup. Hereford: Not for nothing, but I think that cow is taking a swig of urine from a 2 liter Mountain Dew bottle. Hereford: Go Bobcats! Instant retro! Pepper: I’ve been staring at this picture for a few minutes now and I cannot for the life of me figure out what I’m supposed to be looking at. Hereford: Bang Bang brought along last year’s trophy for good luck. Would it help them this year though?…. Pepper: The difference in quality was obvious from the first bite. 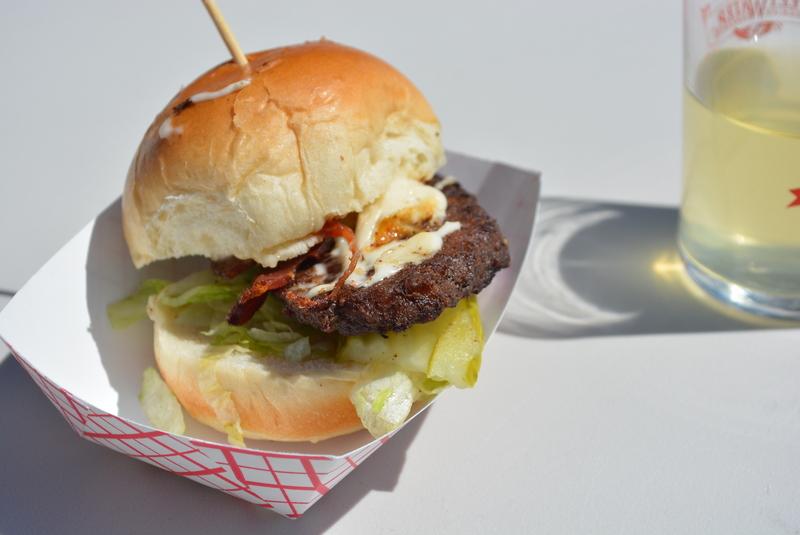 The burger was juicy, the pimento was warm and soft, and there was a complexity of flavor not present in anything else I’d tried that day. Hereford: Honestly, this wasn’t even a competition. 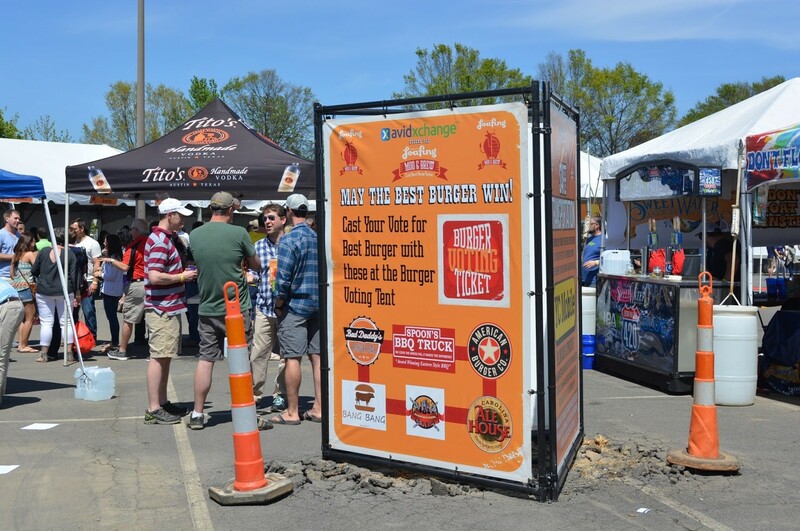 I would have loved to have written a teaser here, and you could find out how I voted further down the page, but it wouldn’t be fair to Bang Bang to make it seem like I even had to think about which burger was the best at the festival. Good job, Joseph and the guys at Bang Bang. Hereford: One of the last beers I got was the Sweet Baby Jesus! 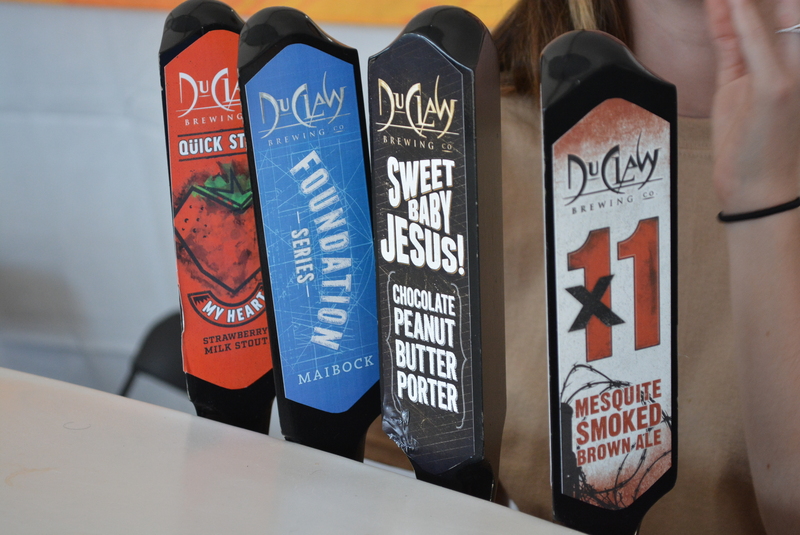 by DuClaw. It was like a dessert in a beer. Delicious. Pepper: It tasted like CHOCOLATE. Hereford: Okay, time to vote. There was no question who I was voting for. Pepper: Like Hereford said, it wasn’t even close. Hereford: We had already left when they announced the winner. For the second year in a row, Bang Bang took away the honors. Again, congratulations. You earned it, Bang Bang. Hereford: Before we left I found the discarded husk of the mascot. Clearly it had shed its outer layer and was now re-growing a new, more terrifying exo-skeleton. Pepper: I dared Hereford to touch it, but he wouldn’t even go near it. Big baby. Pepper: Pretty appropriate sponsor, right? They had a few parked outside the festival, ready for people coming out. I thought that was brilliant. It’s like a reminder plastered on your wrist so when you’re drunk you only have to look down at your arm.